I used to have a love/hate relationship with food. Food was something to be demonized, it made you fat/unhealthy/unattractive/insert-other-BS-here. Let’s avoid it at all costs unless everything has been removed (fat, carbs, salt, sugar, joy). Then one day, I was gifted The 150 Healthiest Foods on Earth. I used to sit and consume this book like it was the Twilight series. It sounds like a diet plan book but it’s quiet the opposite – the author talks through different foods and goes in depth about how incredible they are for your health. Food wasn’t the enemy – it was a super power! Think about how much more satisfying it is to eat an egg when you know that your body is absorbing high doses of vitamins like Selenium, B2, D, B12, protein, and minerals like Zinc, Iron and Copper. Suddenly eggs weren’t fatty nuggets of cholesterol doom. They are something to be prized and happily enjoyed with my morning coffee. So, let’s talk about cabbage. Ugh right? Gross, what a weird vegetable. I feel healthier and more energized just thinking about cabbage. Ok this isn’t a health blog by any means. But I like to share how my perspective has changed from one of subtraction to addition. Let’s look at all the amazing food we’re eating instead of what we feel we need to remove from our diets. So let’s keep that in mind while I present to you THE WORLD’S BEST SANDWICH. 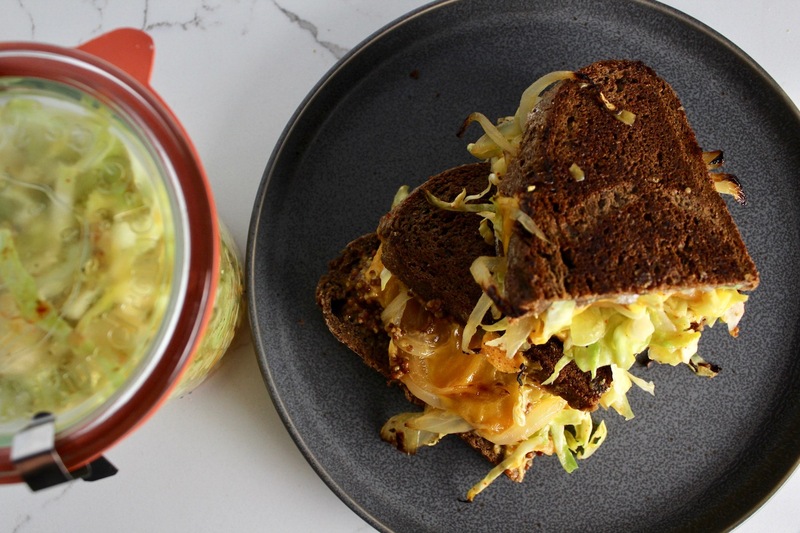 It’s got: fried onions, cheddar, grainy mustard, mayo, honey, spicy cabbage – sandwiched between two slabs of Russian Black Bread. Wait did I say spicy cabbage? Sure did. 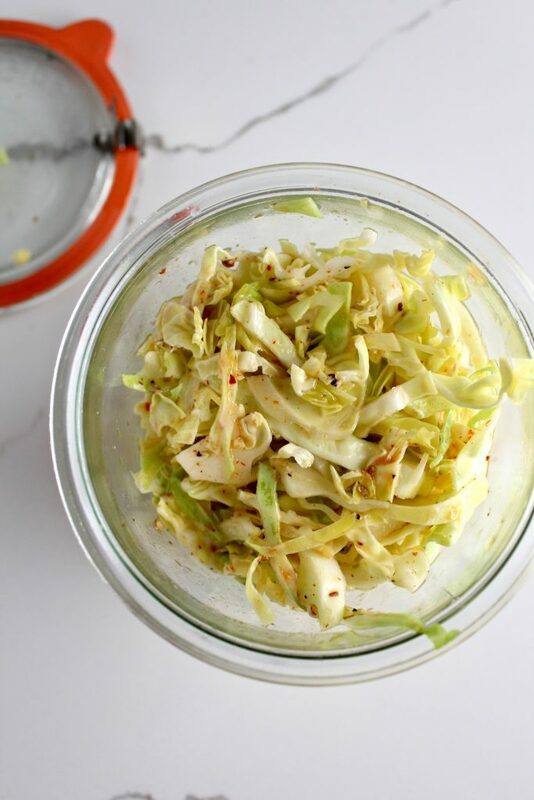 This spicy cabbage isn’t technically a Russian recipe but it is certainly Russian inspired. Russian cuisine routinely involves pickled something which is perhaps my favorite part of a Russian meal. I had a leftover head of green cabbage that was meant for borscht but it forgot to make it’s way into the soup. So, Spicy Cabbage was born and I never looked back. It’s spicy, tangy and makes a beautiful addition to my new favorite sandwich – though this would be a perfect pairing with tacos, soups, fried chicken, dumplings, insert-anything-here. 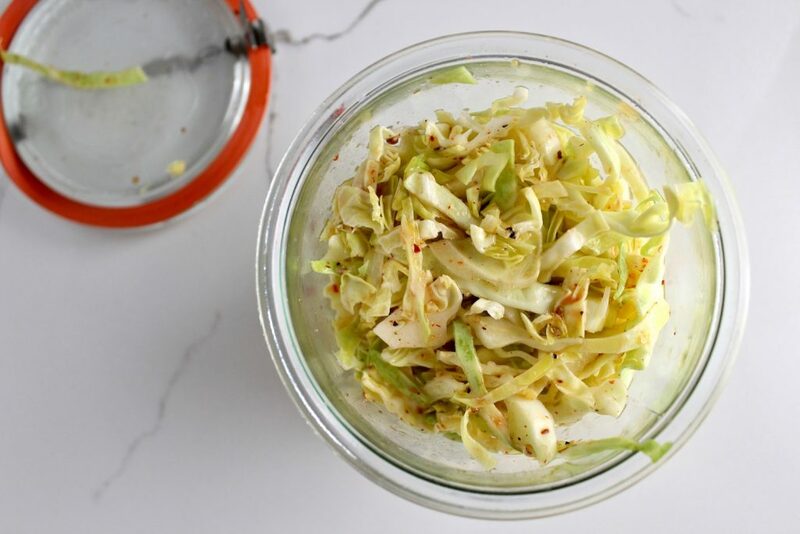 Shred your cabbage into very thin slices. Then mix the cabbage with the rest of the ingredients. Refrigerate for 30 minutes or until you wanna eat it. Let it hang out in a sealed container for up to a week. PUT IT ON EVERYTHING. To make The Best Sandwich in the World – heat a skillet with a little butter. Mayo goes on one slice, grainy mustard goes on the other. 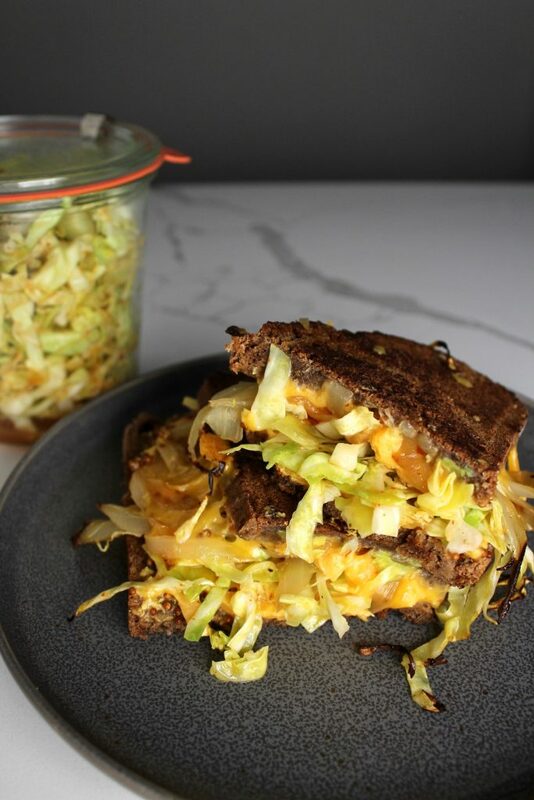 Top one slice with cheddar, fried onions, a drizzle of honey, a giant heap of spicy cabbage, more cheese and the other slice of bread. Carefully place on the skillet and put a heavy plate or lid on the sandwich to get everything to melt together. Flip, remove, and eat endlessly.